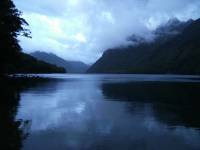 Blog from Milford Sound, New Zealand | Where is the Love? 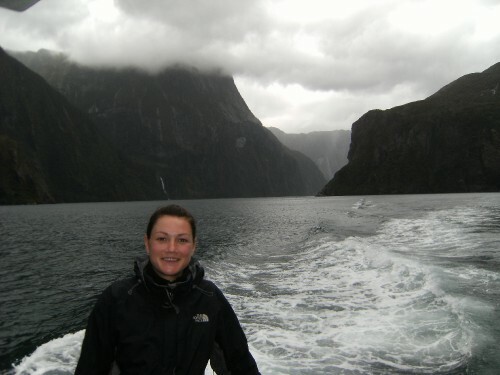 Milford Sound was a long drive from Dunedin on the east coast to Fiordland on the west. 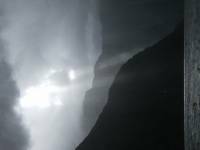 Fiordland is an unpopulated area of national park where several dramatic Fiords have been created when huge glaciers have met the sea. 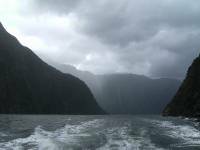 Not a huge area of forest as I first though.We did learn that a fiord is a glacial valley that meets the sea and a sound is where a river valley meets the sea.Unfortunately when early explorers made it to Fiordland they did not know the difference so all the fiords are called sounds, very confusing. 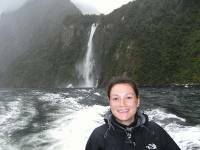 The only fiord accessible by road was Milford Sound.At Te Anau, the last town before venturing in to the national park, we stopped and booked our Milford Sound Cruise the following day.As we saved $15 by going on the first cruise of the day we booked that one, 8:30am. An early start was required and as there was no camping in Milford town we headed for the last DOC campsite on the road at Lake Gun.The scenery on the road was again breathtaking however it became very difficult to see as the cloud and rain came in.Unfortunately it stayed all night.Not much sleep was achieved with the rain pelting off the roof of the campervan and we were almost relieved we had a 6:30 am start the next day. On the way to Milford we past through the Homer Tunnel which would not be out of place on a South American road.The scenery was superb but it was still pelting down and we were unsure if the cruise would go ahead.Fortunately it did.We cruised right out into the Tasman sea passing huge waterfalls on the cliffs of the dramatic fiord and saw lots of New Zealand fur seals.Well worth the money but we were soaked. 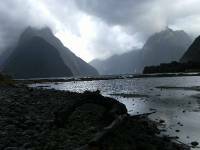 Originally the plan was to do a walk the next day but we had had enough so we left Fiordland and headed for Queenstown.